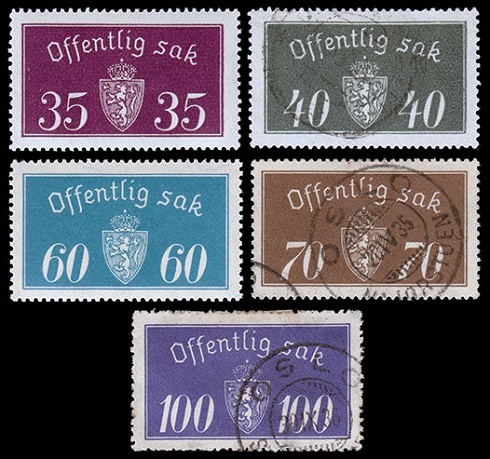 Norwegian stamps, specially designed for use on mail being sent by government agencies, were first issued in 1926. These official stamps were not available for sale in post offices, and they were not valid for use on regular commercial mail. 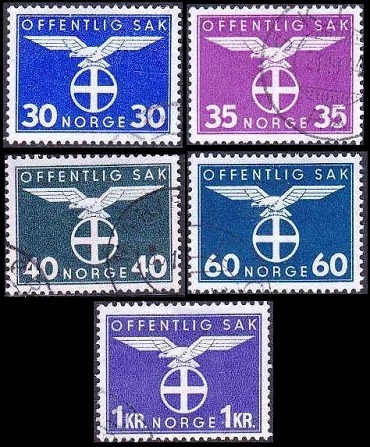 The inscriptions on Norwegian official stamps from 1926 through 1947 are as follows. 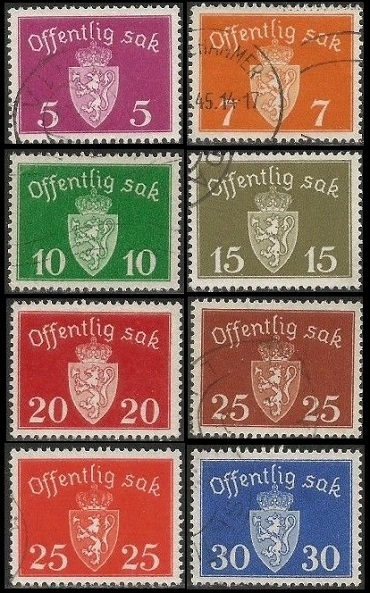 "TJENESTE FRIMERKE", meaning "SERVICE STAMP"
"OFFENTLIG SAK", meaning "PUBLIC ITEMS" or "PUBLIC AFFAIRS"
The seven official Norwegian stamps shown above were issued on January 1, 1926. The common design features the Norwegian Coat of Arms. 05 Ø. (1926 - Sc. #O1) - Rose Lilac. 10 Ø. (1926 - Sc. #O2) - Yellow Green. 15 Ø. (1926 - Sc. #O3) - Indigo. 20 Ø. (1926 - Sc. #O4) - Plum. 30 Ø. (1926 - Sc. #O5) - Slate. 40 Ø. (1926 - Sc. #O6) - Deep Blue. 60 Ø. (1926 - Sc. #O7) - Prussian Blue. 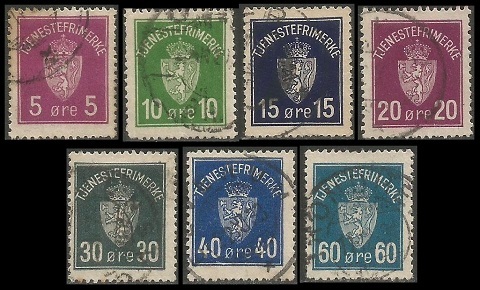 The thirteen major-type official Norwegian stamps shown above were issued between 1933 and 1934. The Scott catalog attributes, for lithographed stamps, with the design measuring 35 x 19 1/4 mm., are as follows. 02 Ø. (1933 - Sc. #O9) - Ocher. 05 Ø. (1933 - Sc. #O10) - Rose Lilac. 07 Ø. (1933 - Sc. #O11) - Orange. 10 Ø. (1933 - Sc. #O12) - Green. 15 Ø. (1933 - Sc. #O13) - Olive. 20 Ø. (1933 - Sc. #O14) - Vermilion. 25 Ø. (1933 - Sc. #O15) - Yellow Brown. 30 Ø. (1933 - Sc. #O16) - Ultramarine. 40 Ø. (1933 - Sc. #O18) - Slate. 60 Ø. (1933 - Sc. #O19) - Blue. 70 Ø. (1933 - Sc. #O20) - Olive Brown. 100 Ø. (1933 - Sc. #O21) - Violet. The Scott catalog attributes, for typographed stamps, with the design measuring 34 x 18 3/4 mm., are as follows. 05 Ø. (1933 - Sc. #O10a) - Rose Lilac. 07 Ø. (1933 - Sc. #O11a) - Orange. 10 Ø. (1933 - Sc. #O12a) - Green. 15 Ø. (1933 - Sc. #O13a) - Olive. 20 Ø. (1933 - Sc. #O14a) - Vermilion. 35 Ø. (1934 - Sc. #O17) - Red Violet. 40 Ø. (1933 - Sc. #O18a) - Slate. 60 Ø. (1933 - Sc. #O19a) - Blue. 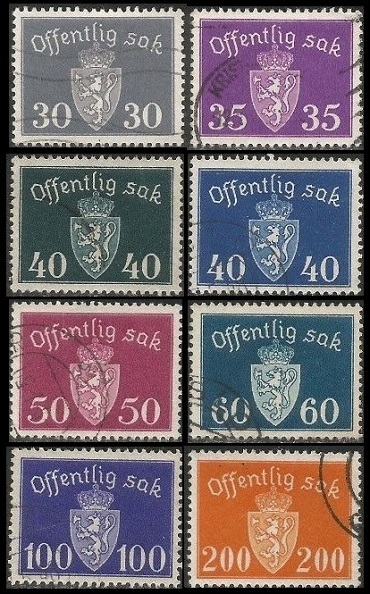 The sixteen major-type official Norwegian stamps shown above were issued between 1937 and 1947. The Scott catalog attributes, for stamps that are printed on watermarked paper, are as follows. 05 Ø. (1938 - Sc. #O22) - Rose Lilac. 07 Ø. (1937 - Sc. #O23) - Deep Orange. 10 Ø. (1937 - Sc. #O24) - Bright Green. 15 Ø. (1937 - Sc. #O25) - Olive Bister. 20 Ø. (1938 - Sc. #O26) - Carmine. 25 Ø. (1938 - Sc. #O27) - Red Brown. 30 Ø. (1937 - Sc. #O28) - Ultramarine. 35 Ø. (1938 - Sc. #O29) - Red Violet. 40 Ø. (1938 - Sc. #O30) - Prussian Green. 60 Ø. (1938 - Sc. #O31) - Prussian Blue. 100 Ø. (1938 - Sc. #O32) - Dark Violet. The Scott catalog attributes, for stamps that are printed on unwatermarked paper, are as follows. 05 Ø. (1941 - Sc. #O33) - Deep Red Lilac. 07 Ø. (1941 - Sc. #O34) - Deep Orange. 10 Ø. (1941 - Sc. #O35) - Bright Green. 15 Ø. (1945 - Sc. #O36) - Olive. 20 Ø. (1939 - Sc. #O37) - Carmine. 25 Ø. (1939 - Sc. #O38) - Red Brown. 25 Ø. (1946 - Sc. #O38A) - Scarlet. 30 Ø. (1939 - Sc. #O39) - Ultramarine. 30 Ø. (1947 - Sc. #O39A) - Dark Gray. 35 Ø. (1941 - Sc. #O40) - Bright Lilac. 40 Ø. (1941 - Sc. #O41) - Greenish Black. 40 Ø. (1946 - Sc. #O41A) - Deep Ultramarine. 50 Ø. (1947 - Sc. #O55) - Deep Magenta. 60 Ø. (1941 - Sc. #O42) - Prussian Blue. 100 Ø. (1941 - Sc. #O43) - Dark Violet. 200 Ø. (1947 - Sc. #O56) - Orange. 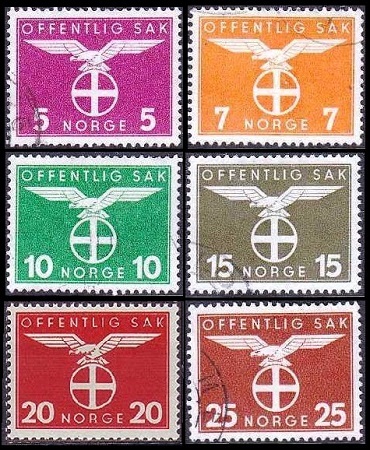 The eleven official Norwegian stamps shown above were issued between 1942 and 1944. The common design features the Norwegian Nasjonal Samling Party emblem. 05 Ø. (1942 - Sc. #O44) - Magenta. 07 Ø. (1942 - Sc. #O45) - Yellow Orange. 10 Ø. (1942 - Sc. #O46) - Emerald. 15 Ø. (1944 - Sc. #O47) - Olive. 20 Ø. (1942 - Sc. #O48) - Bright Red. 25 Ø. (1943 - Sc. #O49) - Red Brown. 30 Ø. (1944 - Sc. #O50) - Bright Ultramarine. 35 Ø. (1943 - Sc. #O51) - Bright Purple. 40 Ø. (1943 - Sc. #O52) - Greenish Black. 60 Ø. (1943 - Sc. #O53) - Indigo. 01 K. (1941 - Sc. #O54) - Blue Violet. 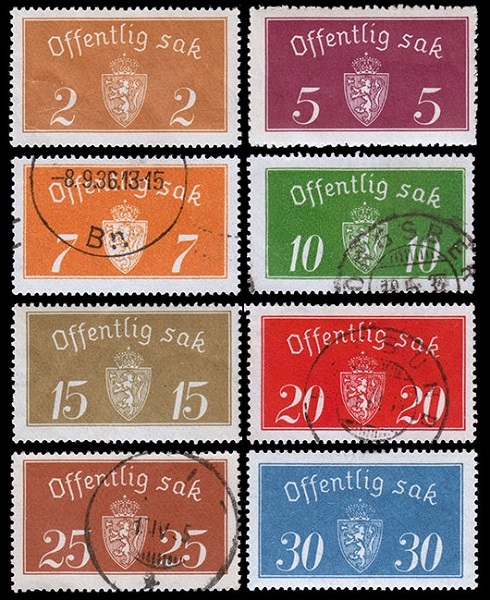 The 02 Ø. on 05 Ø. re-valued Norwegian official stamp shown above (Sc. #O8) was issued on July 1, 1929.